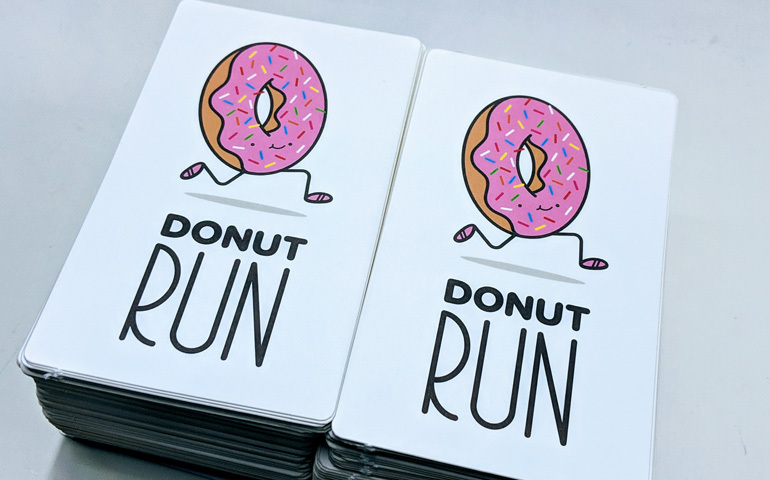 Tortoise and Hare Sports is a running store in Glendale, Arizona, and they've printed up some custom matte stickers to promote their monthly social run that's all about donuts. Tortoise and Hare Sports is the premier destination for running and walking footwear, apparel, and accessories in the West Valley. They pride themselves on delivering exceptional service by educating around functional footwear and running gear, and they provide these products and services for a reasonable price. What's cool about Tortoise and Hare Sports is that they have a proprietary gait analysis system and 5 Point Fit Process that allows them to focus on the customer and teach them about a better running form. 80% of the population is wearing the WRONG shoe! The wrong shoe (size, style, type, or category) can increase your potential for injury, or worse—aggravate the one you already have. The 5 Point Fit Process takes a personal history, from exercise habits to previous injuries to possible goals. Then there's the gait analysis. What follows is the foot measurement and scanning, where they use a 3D foot-scanning station to look at "Foot shape, foot size, ankle orientation and pressure distribution on the bottom of your foot." The 3D scan is then be used to determine shoe size, as well as what shape of shoe and/or insole will best fit the customer's foot and gait. Once the shoe is selected, the customer's running form is recorded on video and analyzed. This is a crucial step in the customer education process, because the video footage helps "assess many factors in form and running gait, including: footstrike, body positioning, cadence, degree of pronation." When it's all done, they pair the customer with the right footwear to help reinforce efficient biomechanics, minimize injury, and increase their enjoyment of being active. Above all else, the Tortoise and Hare staff is passionate about helping each customer successfully pursue goals for a healthy life. By holding these fun running events all year long, Tortoise and Hare Sports creates a community around their core focus as a business: getting people on a run. By giving participants a little takeaway for their event makes a big impact for their brand how the word gets out around Glendale and surrounding communities. The next Donut Run is April 13th, and it's sponsored by New Balance. The Donut Run is an easy fun run, and all abilities are welcome. The course is a 1, 3.3 or 5.3 mile loop around the neighborhood. They ask that runners check "Going" on Facebook so they know how many donuts to get. All abilities welcome, walkers and runners, dogs, and strollers. Join them for donuts and coffee after the run.